This was the inscription on the Marquette Tribune in the first issue of the second semester, released Jan. 3, 1918. Updates from World War I dominated the 12-page paper. Additionally, the Tribune revised the honor roll list to include where the soon-to-be soldiers were stationed across the country and along the Western Front. While campus and the rest of the country were focused on the Great War, there was one sports article. 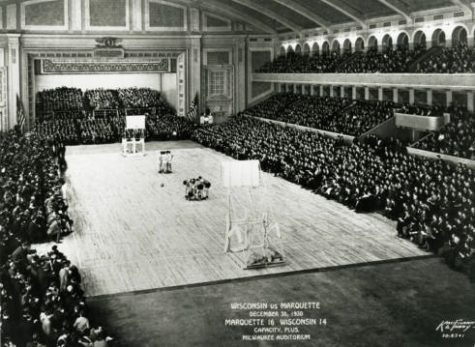 It was a month-old basketball story recapping a tightly-contested affair between Marquette and the University of Wisconsin-Madison Dec. 19, 1917, the first basketball game ever played between the two schools. Wisconsin narrowly defeated Marquette, 15-14, in the first meeting. With the game tied at 14-14 and the Badgers with possession, Wisconsin team captain William Chandler drew a foul. The timekeeper said the game clock expired before the foul was called, but the referees did not hear the signal. As a result, Chandler went to the free-throw line and sank the game-winning shot. A century later, the Golden Eagles and Badgers will meet again in Madison, the place where it all began. Since that first game, the two schools have combined to produce an astounding 95 NBA players, 51 NCAA All-Americans and two NCAA national championships. The two schools have met each other almost every year since 1930, regardless of whether they were dismal or nationally ranked. Players, coaches and fans have graduated or died, but the passion has never swayed. The series used to divide the state more than once per year, as the two teams played a home-and-away series every year from 1933 to 1951, among other stretches in program history. 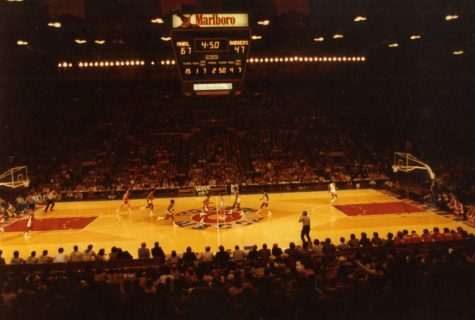 No matter where the game was held, fans would come out in droves to watch the drama. 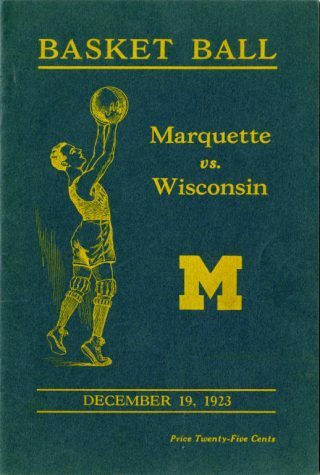 A major flashpoint for the rivalry came in 1930 when Chandler, the player who hit the game-winning foul shot in the first matchup to beat Marquette, was hired as Marquette’s coach. He eventually became the longest-tenured coach in program history, totaling 193 victories in Milwaukee, and only 40 behind Al McGuire’s mark as the coach with the most wins in Marquette basketball history. Chandler was not the only one to switch sides. Players Doug Gill and Rube Schulz committed to the Badgers in the class of 1950. Schulz stayed for his freshman orientation week at Wisconsin and by Saturday morning, he and Gill had enough. He borrowed his friend’s car and drove to Milwaukee, where Marquette team officials met them to accept the two players’ request to transfer. Gill and Schulz helped lead the Warriors to their first-ever NCAA Tournament, where they lost in the Elite Eight. As a result, Bud Foster, Wisconsin’s head coach at the time, refused to play the Warriors for three seasons. Longtime Milwaukee Journal sports editor Bob Wolf, who was a student manager for Wisconsin a few years before the incident, wrote scathing articles about Schulz, calling him “Rube’s Rhubarb” in reference to the poisonous substance left by rhubarb leaves. Badger fans viewed Schulz as a traitor, but Marquette fans loved him. The tides of the rivalry forever changed when Al McGuire was named Marquette head coach in 1964. McGuire dominated the rivalry, winning 19 games against the Badgers including 14 consecutive wins from 1969-’77. The most memorable game in series history occurred during this stretch, when Marquette defeated Wisconsin on a buzzer-beater in 1974. Wisconsin was up 47-38 with under six minutes to go when Marquette’s Bo Ellis and Lloyd Walton started whittling the Badger lead down. With just over a minute to play, Ellis scored two straight baskets to bring Marquette within a point with 47 seconds remaining. After unsuccessfully attempting a steal, the Warriors had to foul, eventually tagging Wisconsin center Kim Hughes with 17 seconds left.. He missed both free throws, leaving the door open for Marquette’s Maurice Lucas. With just seconds remaining, teammate Dave Delsman handed the ball off to Lucas, who fumbled the pass, but found the composure to regain possession and gracefully fire up a prayer from 20 feet away. It went in. The arena descended into a madness. McGuire hopped on top of the scorers table and raised his fists. Thus, the most famous photograph of the rivalry was born. “You’re going to get a close game in this rivalry even if one team enters the game 18-1 and the other is 1-18,” McGuire said after the game. The Marquette Tribune’s story called Lucas “The Joker,” in reference to the popular Steve Miller Band tune. 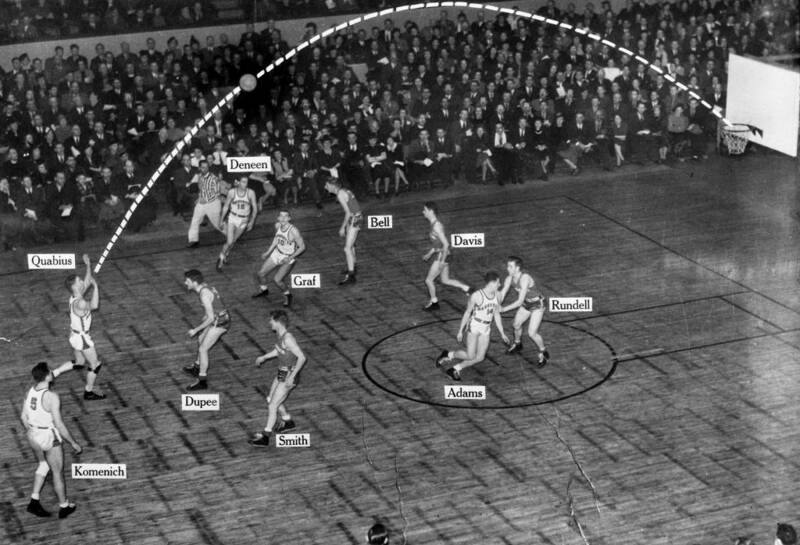 Wisconsin coach John Powless “was bumming cigarettes and smoking them furiously” while his players protested in vain that teammate Dale Koehler’s basket at the end of the first half, which the refs said occurred after the game clock expired, should have counted, per the next day’s Milwaukee Journal. More recently, the mid-to-late 2000s were full of close matchups. In nine of the 17 games since the turn of the century, at least one team was ranked in the top 25. The highest ranking for either side entering the clash occurred in 2014, when the No. 2 Badgers beat Marquette in head coach Steve Wojciechowski’s first game against the Badgers. When Saturday’s contest tips off, another chapter will be added to the century-long saga, one that will surely promise as much drama and controversy as the first 100 years.